First appearing on the scene a couple years ago as a prize for the #EdCM social media quiz of the year, and as an exclusive bijou iPhone case for Jon Mountjoy, Jock and Morag accessories are now available for everyone. Creator, designer & close friend of mine, Juliet Wilson (also known as Little Dishy) has just launched her newest venture, Jock and Morag. 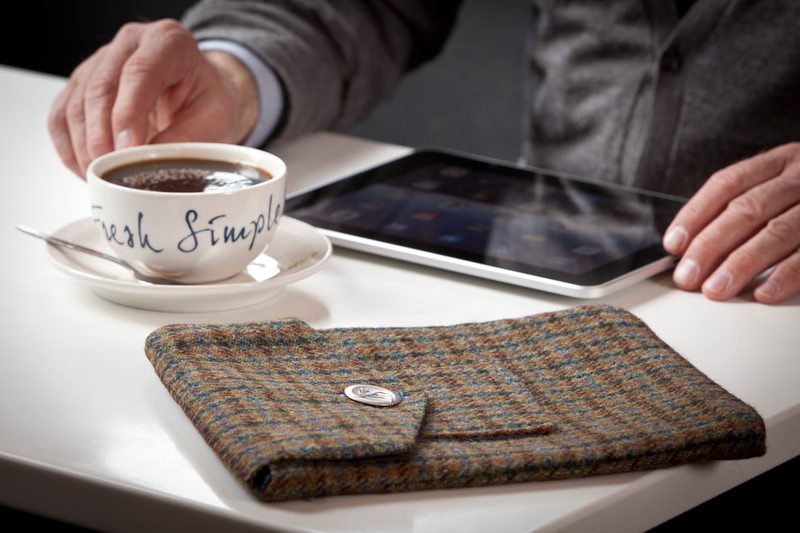 Harris Tweet combines Juliet’s love of Apple products, Twitter, Tweed and results in gorgeous cases for your laptop, iPhone, iPod or iPad. Just in time for Christmas, she’s done stockings too! Yes, I wanted to write to spread the word about Jock and Morag, but I also wanted to delve a bit more into the creation of Juliet’s venture. We have a really great group of friends, with whom we met at a weekly meeting we started going to about 3 or 4 years ago – and no, it’s not AA. Cheeky. The infamous Edinburgh Coffee Morning (EdCM), where several of us met, appropriately, to discuss our computers, iphones, twitter accounts and all things digital & social media related. So what’s my point? Another post about EdCM?! NO, it’s not, in fact it’s more about the people. Juliet began with the idea and the talent. Let’s break it all down: The pictures for the Harris Tweet website and catalogue were done by Brendan MacNeill of Brendan MacNeill photography. The models were none other than Juliet herself, Nev Stokes and Mr. Mike Coulter – the father of EdCM and site build by Richard Cross (who swears he’s coming back to coffee morning one day!). ZanZero – the sister restaurant of Centotre, owned by our good friends Victor & Carina Contini, who patiently put up with us ever Friday morning (and a few days throughout the week as well!). I wanted to mention this because I think it’s amazing to have such an attachment to a product by means of the people associated with it. Usually you probably know one person involved in such a neat project, but to know the whole team, well that’s just extra special and shows what a great and talented group of people we surround ourselves with. To end – these are the must have gift of the year, so check out the Harris Tweet website, follow on @JockandMorag and order yours today! p.s. Check out the buttons – custom made for Jock and Morag – I love the buttons! Great product, great post Darcie, and I was delighted to discover that when the site launched, I was its very first customer. Nice post Darcie! I am honoured to be a proud owner of the prototype. Juliet has done wonders.